Most people know that yogurt (at least the unsweetened kind with live cultures) is a healthy option, but few people consider the many other foods rich in beneficial bacteria or yeasts that help boost health. Here are 10 of my favorite probiotic-rich picks to add to your diet. Some, but not most, cheeses offer probiotics, including: yogurt cheese (made from straining yogurt through a cheesecloth to thicken it) and some unpasteurized dairy-free cheeses made through the addition of probiotic cultures (see The Probiotic Promise for recipes and instructions). These probiotic-rich cheeses usually contain the cultures used to inoculate them so the health benefits can vary widely depending on the probiotic powder or capsule contents used. An El Salvadorian condiment, curtido is like a cross between salsa and kimchi. 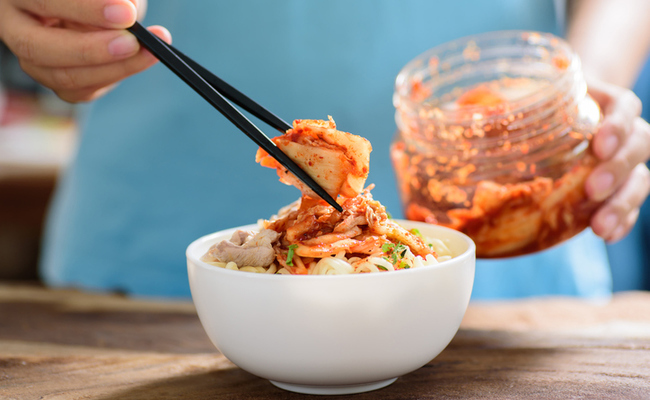 Like kimchi, it is packed with a wide range of probiotic strains and has many of the same health benefits as kimchi (see below) thanks to similar strains and ingredients. Kefir (pronounced ke-FEER) is similar to a drinkable form of yogurt but is much healthier thanks to having ten times more different types of probiotic strains than yogurt. It naturally contains B-vitamins that give an energy boost, aids digestion and helps to regulate blood sugar and cholesterol levels. The national dish of Korea is typically a fermented mixture of cabbage, chilis and garlic. Research at Georgia State University found that the probiotics, namely L. plantarum, found in Korea’s national food, confers protection against the flu by regulating the body’s innate immunity. Kombucha (pronounced kom-BOO-shuh) is a beverage believed to have been made in Russia and China for over 2000 years, although the exact origin is unknown. The bacteria and yeasts that form the kombucha culture form a type of “floating mat” on the surface of the black or green or other type of tea from which it is typically made. It improves immunity against some diseases. According to research, consumption of kombucha has potential for prevention of a broad-spectrum of metabolic and infectious disorders. A Russian grain-based drink that is made by adding yeast to bread and water and allowing it to ferment, kvass in most health food stores is often made with beets or carrots instead. While carrot kvass has many of the same nutrients as carrot juice, it usually has much less sugar thanks to microbes that digest the sugar and confer probiotic benefits in the process. If you choose a beet-based kvass, be sure to choose one that is non-genetically-modified since beets are usually GMO. Miso is usually made from fermented soybeans, although there are also rice and chickpea miso as well. A staple in the Japanese diet, miso is rich in vitamins, minerals, protein, good carbs and probiotics (provided it isn’t heated as it often is when used in miso soup). Regular consumption of miso has been linked to protection against cancer. A study published in the Hiroshima Journal of Medical Science found that the long-term consumption of miso on animals with lung cancer could exert cancer-preventive and protective effects. Most pickles have been pasteurized and therefore do not have any probiotics left, if they ever had them at all. The process of pickling foods in white vinegar does not contribute to the development of probiotic cultures; however, fermented vegetables in brine (similar to sauerkraut) does lead to the development of beneficial bacteria and some yeasts that also boost health. My favorites are green beans pickled with chilis or cultured onions. Some yogurt reduces cholesterol and normalizes blood sugar levels; some reduces homocysteine levels which in turn reduces the risk of diseases linked to high levels of this compound, including: heart attack, stroke and diabetes. Yogurt has also been found to reduce the duration of respiratory infections. Sauerkraut is one of the most overlooked superfoods. Lactobacillus plantarum and L. mesenteroides found in this German staple actually fight off harmful infections like E. coli. L. plantarum has anti-viral effects, making it a potential ally in treating colds, flu, ebola, HIV, chronic fatigue syndrome or other viral conditions. Keep in mind that any probiotic-rich food needs to contain “live cultures” and be “unpasteurized.” If a product does not have either of these claims on the label, it is best avoided. Additionally, probiotic-rich foods need to be refrigerated. If you find them on the shelves in the center aisles of your grocery store that means the product has been pasteurized for preservation and no longer offers any of the benefits of live cultures. For more information, consult my book The Probiotic Promise: Simple Steps to Heal Your Body from the Inside Out. Does Eating Miso Really Help Protect against Radiation?